This post is sponsored by The Little Potato Company. 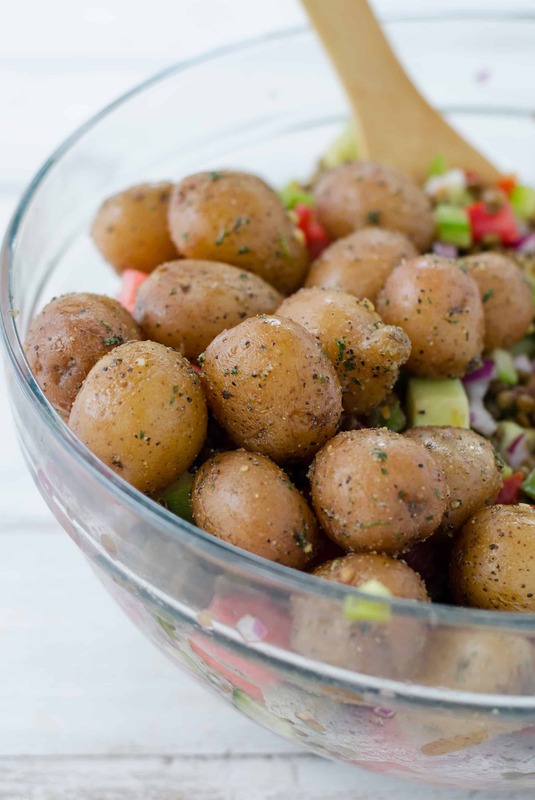 Hooray for adorable, nutrient-rich mini-potatoes! Happy 4th of July! And for non-American friends, um, happy Monday. What are your plans for the day? BL and I are currently snuggled in our tiny beach airBnB for the week, trying to soak up as much sun as possible in-between rain storms. Honestly, it doesn’t even matter. We’re at the beach! After being land-locked for the past year, I’m ecstatic just to dip my toes in the ocean. The coast! I’ve missed you. The 4th of July is hands down one of my favorite holidays. Which, shouldn’t be a surprise to anyone. 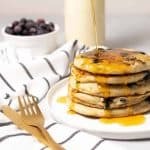 A holiday that’s typically spent outdoors, with family and friends and copious amounts of grilled food and refreshing cocktails. I look forward to it every year. We haven’t quite figured out our plans for the afternoon yet, but I have a feeling they will involve a bonfire on the beach (we brought this log with us), corn on the cob and s’mores. As a vegetarian, I know that the best part about most potluck gatherings are the side dishes. Honestly, even before I gave up meat, that’s usually what you would find on my plate: heaps of salad, pasta, beans, corn (and a brownie to finish). I’ve always been a side-dish kinda girl, and love to mix and match various salad ingredients throughout the summer. In fact, it’s recently become my go-to menu for easy entertaining. Instead of worrying about what I’m going to make for a “main”, I lay out a few hearty salad and some bruschetta and call it a day. It’s fuss free and pleases just about every dietary preference. 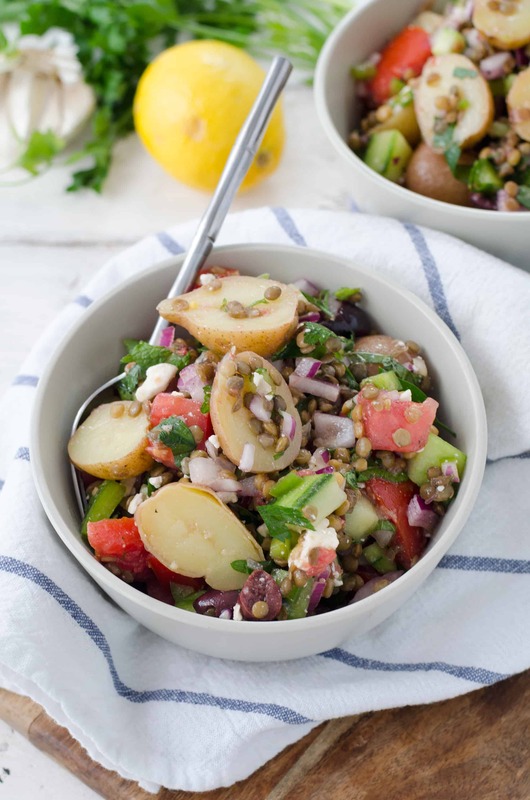 This potato and lentil salad is quickly becoming a favorite in my house. 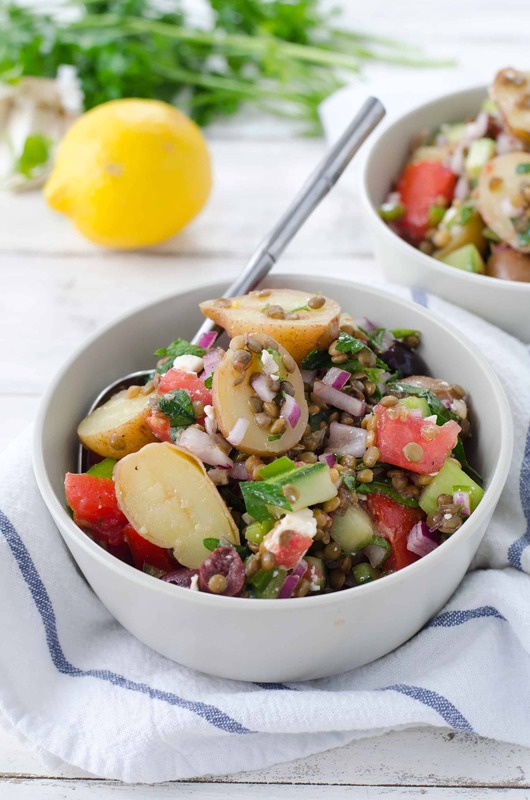 Seasoned creamer potatoes, lentils, tomatoes, cucumbers and onion tossed in a tangy lemon dressing and plenty of fresh herbs. It’s so simple to put together, healthy and filling. To cut down on prep-time, I’m using The Little Potato Company‘s microwave potatoes. Friends, this has become my new favorite way of preparing potatoes. Just pop the potatoes in the microwave, let steam then toss with the garlic and parsley seasoning packet. Honestly, I wasn’t sure what to expect when I saw microwave potato packets, but you can’t tell the difference between these and steamed. Creamy, delicious and perfectly seasoned. Plus, they are ready in just 5 minutes. In the words of Ina, #howeasyisthat? Aren’t those mini potatoes just adorable? I popped a handful of them into my mouth as I finished plating the rest of the salad. I love how bite size they are- no peeling required! You can leave them whole, or halve them once their cooked. 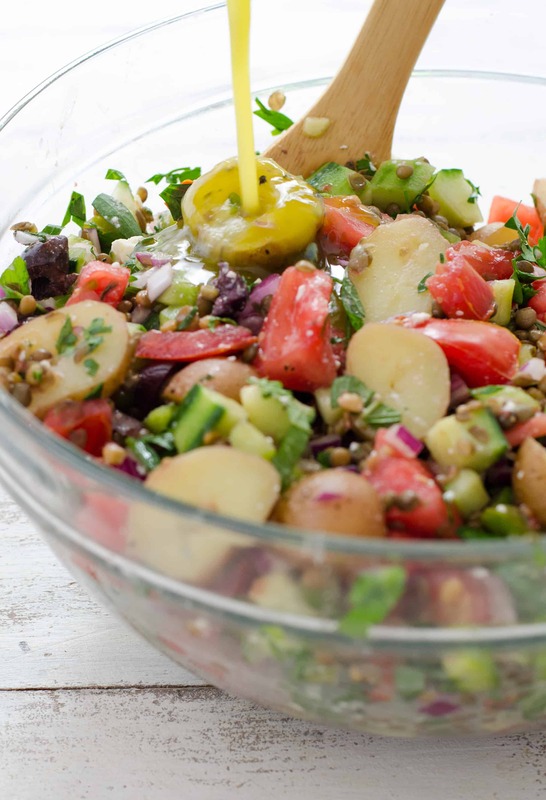 The other star of this salad is large handful of freshly chopped herbs. 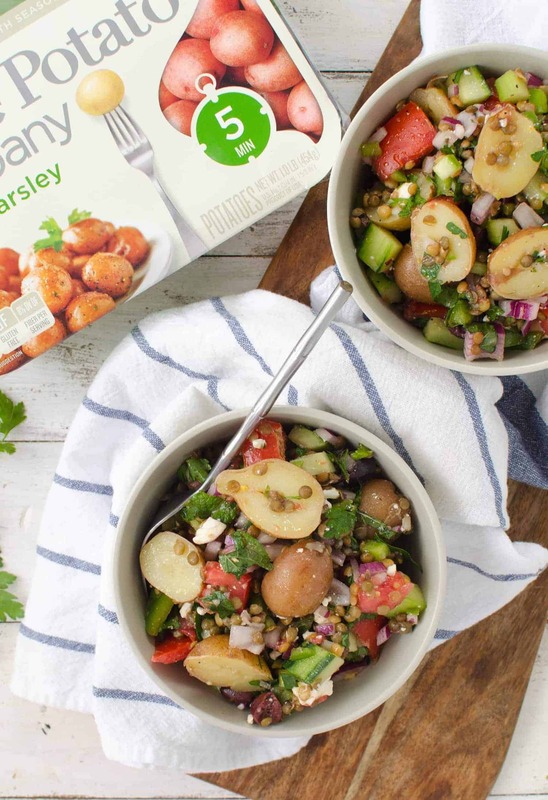 I’m using a combination of parsley and mint for a bright, refreshing take on potato salad. Tossed with a vibrant lemon dressing and this dish is so, so summery. With 23g of fiber and 21g of protein per serving, it’s a filling, nutrient-dense meal. You can find Little Potato Company packets in the produce section of most major grocery stores. Seriously, these things are life-changing. A side dish that’s ready in minutes? Yes, yes, yes. Wishing you a wonderful holiday filled with friends, love and good food. Please send sunshine our way. Place potatoes in the microwave and cook for 5 minutes. Remove, let stand 2 minutes and mix with garlic-herb seasoning packet. Place in a large bowl. Now, this is a bowl I want to dive into! Love the lentils with the mint. Nice twist on a summer classic! You lucky duck. The beach is the best for this time of year. Enjoy it! And this combo of ingredients is making my mouth water. I love mint, feta, parsley, lemon!! Gah! Delish! I’m such a fan of the Little Potato Company potatoes! 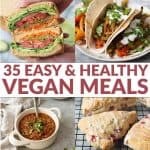 This is such an awesome recipe – love the veggies mixed in, and the lentils? That’s brilliant! Yum! this looks SO delicious! Love how filling and healthy it is! YES! I so love everything in this salad!!! Oh who am I kidding I love anything with potatoes :)So glad you stopped by my site! Love your food! Looks so good! Definitely saving this to recipe and plan on trying it out soon.